An excellent presentation of the Barcelona Pavilion with exquisite renderings, background information, and a tour via HTML or QuckTime VR is available on the web from the School of Architecture Property and Planning at the University of Auckland, New Zealand. Our test version is different from the original pavilion, and the animations placed into the model may not be appropriate regarding the intended spirit of this building. We hope, however, that these sacrileges do not offend the many admirers of Mies van der Rohe's work. 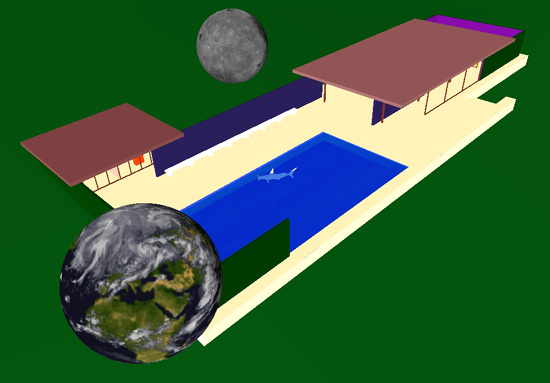 Load the VRML 2.0 model (563K + 266K textures) of the Barcelona Pavilion and explore. Click trough the viewpoint list for a guided tour. Note: A reader of this page from Spain pointed out to us that the Barcelona Pavilion was rebuild between 1981 and 1986 in the Montjuic mountains, site of the Barcelona 1929 International Exposition, where this jewel of architecture can now be seen again. Thanks to Josep Maria Beroy for this valuable information.